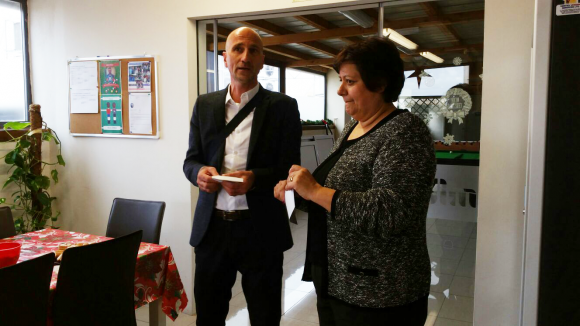 Ħandaq Malta, 6th December 2016: The BMIT team today donated the sum of €3,100 to Puttinu Cares Foundation, having raised the money through various activities in the past months, including games tournaments, raffles and other donations from staff members and the company. The sum was presented to Mr Andrew Decelis, a Puttinu Cares Foundation board member, at BMIT offices. Mr Decelis expressed his gratitude to the company and all employees, and explained that the money will go towards supporting Puttinu Cares’ ongoing initiative to purchase more apartments closer to Central London. “We are proud to be supporting Puttinu Cares once again. In previous years we had supported organisations fundraising for the Puttinu Cares Foundation, but this year opted to contribute directly towards this cause,” said Christian Sammut, Chief Executive Officer at BMIT. "BMIT employees have taken part in fundraising activities almost on a weekly basis, and by December we have proudly exceeded the target set at the beginning of the year," added Maria Zheng Borg, who organised and coordinated all activities related to the fundraising. The Puttinu Cares Foundation offers accommodation for when families need to go abroad to pursue further treatment in the UK.